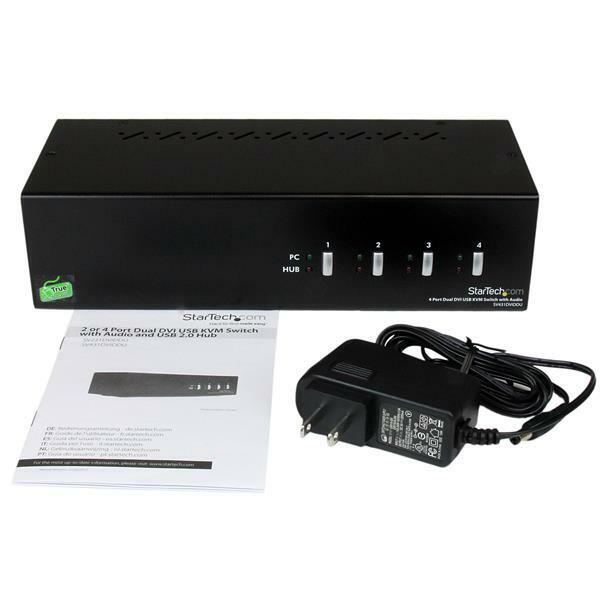 The SV431DVIDDU 4 Port Dual DVI USB KVM Switch with Audio allows four PCs, each with dual DVI outputs, to share two monitors, a microphone and set of speakers, a keyboard and mouse as well as two other USB peripherals. 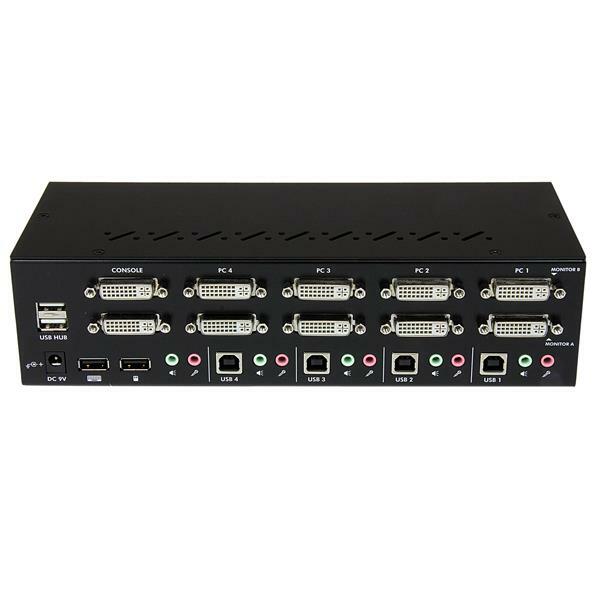 An ideal solution for graphic and CAD/CAM designers, education and financial institutions, the Dual DVI KVM Switch allows you to instantly switch back and forth between PCs at the touch of a button while maintaining professional level video quality on both DVI monitors. 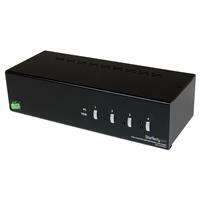 An integrated USB hub allows USB 2.0 peripherals (external hard drives, web cams, etc.) to be shared - eliminating duplicate peripheral costs, and the hassle of connecting and disconnecting devices to multiple machines. Please Note: While both DVI-I (analog mode) and DVI-D (digital only) are supported by the KVM, all source PCs should output the same signal type for proper switching. 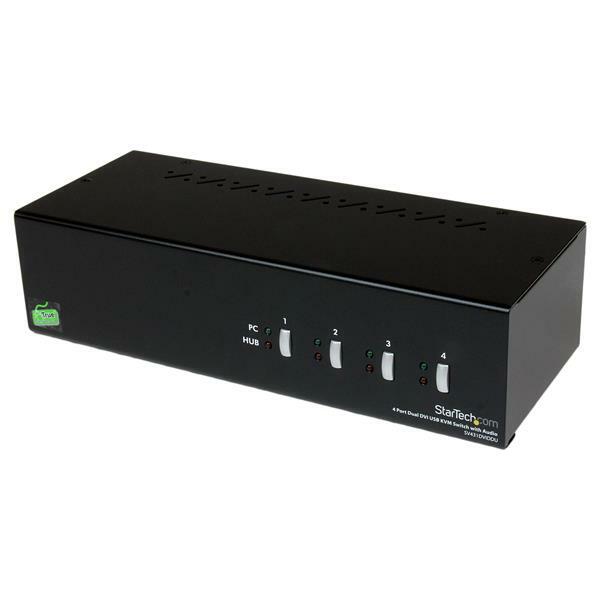 It is recommended wherever possible to use DVI-D cables across all PC to KVM and KVM to Console connections. Please contact technical support if you require assistance identifying your source. How do I convert the DVI-I output port on this device to VGA, HDMI, or DisplayPort? 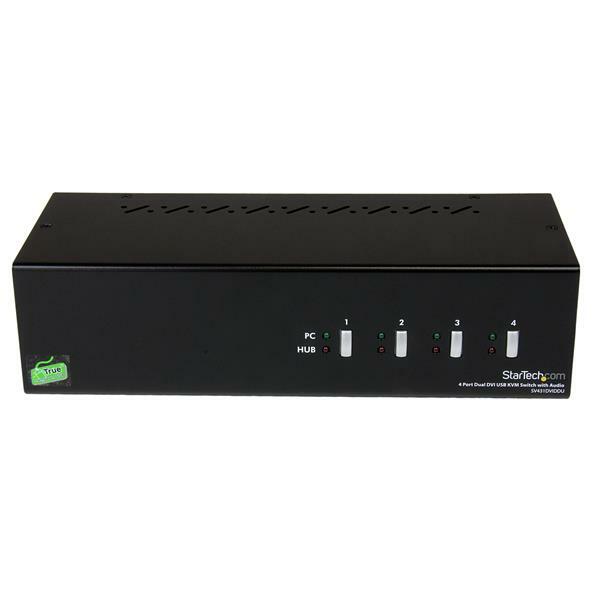 This device has a DVI-I connector and is compatible with both analog and digital DVI video signaling. If you have a display or video destination that uses another type of video connection, there are ways that you can convert the video signal or connection. These options are outlined below and organized by the target connection. VGA DVI to VGA: https://www.startech.com/Cables/Audio-Video/Video-Adapter/DVIVGA/. DisplayPort DVI to DisplayPort: https://www.startech.com/AV/Converters/Video/?filter_AVINPUT=HDMI&filter_AVOUTPUT=DisplayPort. My mouse does not move properly between my monitors; what do I do? Click Appearance and Personalization, then click Display. Click the Resolution or Adjust Resolution option from the left column, which will display your monitors as numbered icons. Click Identify to display the numbers on each connected monitor, showing how the operating system has assigned their positions. Click and drag the monitor icons to best match your physical setup. Click OK to apply the changes and close the window. Click the Settings tab, which will display your monitors as numbered icons. When should I upgrade my device's firmware? You should not upgrade your device's firmware if you do not have any issues with the functionality of your device. The only time you should consider an upgrade is if you are experiencing a problem with the device, and you have confirmed that the firmware addresses this problem. You can confirm this is the case by reviewing the documentation included with the firmware or by consulting with our Technical Support team. Incorrectly upgrading firmware can result in diminished performance so it is best to contact StarTech.com if you would like to perform this operation. (4 stars) SOLUTION: If the monitors and USB become unbound! The manual doesn't say so, but there is another key combination to know about. The manual details using the Q and W to bind/unbind the selected audio channel from the selected monitor+USB. However, what they don't tell you is that it's possible to also unbind the USB hub from the monitor channel. When that happens, your kybd and mouse won't move with the monitors, and you'll have to use the Fn in addition to the n command [n=1..4] to get them linked. Well, I found that the Z and X commands will bind and unbind the USB, respectively. This is likely true for all these types of products.